As 2017 comes to end, many organizations, companies, the team are planning for the year 2018. 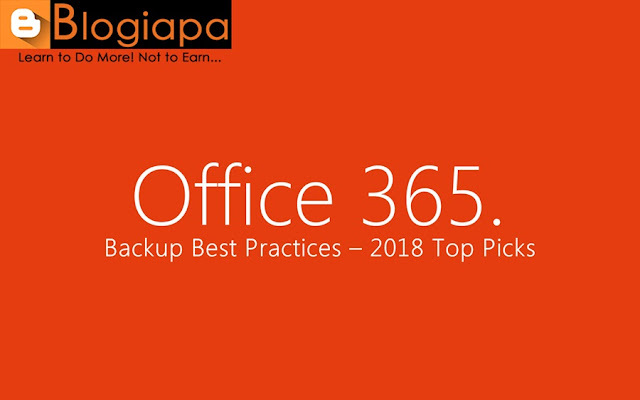 In this article, we will take a look at some Office 365 backup best practices – 2018, statistics from the past year that helps in growing organizations. As 2017 comes to end, many organizations, companies, the team are planning for the year 2018. In this article, we will take a look at some Office 365 backup best practices – 2018, statistics from the past year that helps in growing organizations. Still, there are many enterprises that don’t back up Office 365 or thinks it’s not necessary to back up the Office 365 mailbox. When it comes to being prepared for a disaster, one can never be too prepared to handle. According to The Aberdeen Group, 32% of organizations said that they lost data in the cloud. The reason might vary i.e. data loss occur due to deletion of data or hackers tried to delete data forcefully or due to any other errors. Any loss of data could potentially impact a business or department. While planning for Office 365 Backup and Recovery strategy in 2018 keep below information in mind. Whenever Office 365 users delete emails or folders from mailbox items, that data head to the Recycle Bin. While User can easily restore emails back from Office 365 Recycle Bin. But finding the right file can be difficult as no search option exists in Office 365. So, the user cannot completely rely on Recycle bin to restore deleted data. As well as retention period time is limited, data may disappear after a few days. Completely relying on Recycle bin cannot be Office 365 backup best practice. Office 365 E3 and E5 versions Offer user tools like Office 365 In-Place Archiving and Litigation Hold. When Litigation Hold is enabled in Office 365 account, all mailbox items are placed on hold. Also, using In-Place Hold user can preserve only those emails that meet the criteria of a search query defined using In-Place eDiscovery Utility. It helps to archive a user’s personal mailbox outside. Archiving Of Exchange Online mails sounds like the O365 Backup process. However, till now Microsoft speaks that Office 365 Backup doesn’t come under Office 365 license. If you want to backup office 365 mailbox including Emails, Contacts, Calendar to a number of classic email formats, including PST, EML, MSG, or MBOX, you may want to look at SysTools Office 365 Backup Solution. This product runs on both Windows and MacOS and has bloated features export Office 365 mailbox to PST and other file formats. This solution falls under Office 365 Backup Best Practices – 2018 as can be helpful under various circumstances. Data Stored outside of Exchange Online, are not backed up by some 3rd party Solution or backing up these data can be costly. Also, no backup is provided by Microsoft Office 365. As the organization is migrating to Office 365 and in-application file-sharing becomes the trend, many data are stored within One drive. Before deleting data from one drive be careful. Know more about Onedrive and SharePoint Data Retention Policy. Onedrive and SharePoint Data Retention Policy. Maximum time taken while recovering the data. Creating predefined timeframes to restore deleted data helps to refine recovery points. Also, helps to classify the data that is being backed up. The Scale or level from where data can be recovered. It is recommended that you should go through each of these components in more details to set up best Office 365 backup and recovery practice. As you plan your journey to the cloud, Office 365 Backup Best Practices – 2018 Top Picks helps you to build your backup plans. Performing each step carefully will help to grow the organization and secure your data from sudden unknown disaster. Be sure to check out Microsoft Office blogs regularly for more helpful tips on to manage, and protect Office 365 Data.